The International Window Film Conference and Tint-Off™ once again co-located its event with the Independent Glass Association’s (IGA) Independents’ Days annual conference. This year it also took place on the heels of the National Windshield Repair Association’s (NWRA) annual conference, with all three industries converging on the Spring Glass Show™ for a trade show that had a little something to offer everyone who attended any of the events. The conference got under way on Friday, March 3, with a keynote speech by John Baker of the Sandler Sales Institute. Returning for the second year in a row as keynote, Baker took his audience through the Sandler Sales method, explaining the best way to engage a potential customer and not turn them off with immediate and high-pressure sales tactics. Advising against giving free advice and letting the potential customer lead the shop on, Baker suggested methods of building rapport with the customer. “Take one look around their office and you can get a sense of who they are,” he said. Not only does observing their professional surroundings help you pick out points and aspects about them as people that will help shape the non-sales sales pitch. For kinetic and visual people, Baker said, bring samples of film that they can see and touch. Wrapping up with a raffle drawing of a book, about the Sandler Sales method, Baker’s presentation made way for Ed Golda, president of Michigan Glass Coatings, who shared his secrets to success. Golda can personally attest to the effectiveness of the Sandler Sales method. He informed his audience from the start that he employs the method and went on to share many more aspects of how he runs his company, as well as information about his profit margins and success rate—information few others in any industry are comfortable with sharing. “I have one installer, Dave, he’s been with me since he was 16. He’s 41 now with a wife and kids,” Golda said. Dave, it turns out, makes upward of $20 an hour and is paid by the hour. Golda also covers gas and insurance if a salesperson chooses to use his or her personal vehicle for the job, and provides his employees with company wear for all seasons. He, like Baker, took questions from the audience throughout the course of his presentation and never declined to answer. Sun Shade and Graphic Inc.
Conference seminars broke at noon for the second day of the Spring Glass Show and the window film community found lots to see and do. Johnson Window Films, a diamond sponsor of the event, had one of the largest booths at the show overall, complete with couches and a mini-bar. Madico, Commonwealth Laminating and Coating/ SunTek, FTI and 3M were all there, too, giving away freebies to the contestants of the International Window Film Tint-Off and sharing the benefits of window film with members of the auto glass industry as well as meeting up with window film installers and shop owners. Window film installation demonstrations were taking place on the show floor, too, with Dan Shaw, the 2003 World’s Best Tinter showing how to film a 2006 Jetta. Just an hour later, Charlie Arakelian, the second place finisher in the 2005 Architectural Glass Tint-Off™ drew an equally big crowd with his demonstration of flat-glass installation techniques. Starting off with questions culled from inquiries made to Window Film magazine either on the magazine’s message board or directly to the editor and publisher, the panelists were asked about “shelf-life” of film. “Shelf life is a misconception,” said Stewart, who explained how the film is packaged, usually within an airtight sleeve that effectively hermetically seals the film and protects it against the elements. This airtight packaging preserves the film’s integrity. “We generally say three years, but we’ve all seen it last longer than that” said Lawson, prompting responses from the audience of their longest-lasting film stories, including Jeff Child of Studio Tint in Las Vegas, who said he’s had one particular role of film for 15 years. Nanotechnology is on the horizon, the panelists agreed, and window film shops and technicians can expect that in the next year or two, the market will boom with the technology that adds a special coating to the manufacturing process to reduce infrared rays. “It’s also known as ‘IR’ film. You’ll hear it and see it a lot more in the future. It’s a niche-market type product; it’s more expensive and predominately used for flat-glass installations. It has a high VLT and is hard to shrink,” said Stewart. “Is it safe for dual pane glass?” an audience member inquired and received an affirmative answer. What should a company do if they have technical questions? Where do they go to get the information they are seeking? The answer is start with the manufacturer’s website and, if you can’t find what you’re looking for there, call your local representative; it’s part of what the manufacturers see as their role in the industry—providing information to help support the dealer base. How about those claims of bulletproof film? Knowing that there is a plethora of information floating around the world about just what security film is and what it can do, Lawson encouraged attendees to talk to their manufacturers to make sure that they know what they are buying and what questions they should ask if they are investing in security film. Manufacturers, it seems, are equally concerned about the use and installation of illegal film and won’t warranty work that has been performed illegally. Wells strongly advises shops against it, recounting for her audience a story of a film shop with which she was associated that was found to be installing illegal film and just what it did to the business. “We went from eight cars a day to zero, overnight, when these allegations were publicized,” she said adding what it took to come back from the allegations—a lot, including random spot-checks by undercover officers for ten years after the initial allegations. Additionally, the manufacturer representatives are as concerned with the safety of the installers as installers are—or should be. Conference attendee Doug Templer, with Sun Scape Tinting in Central Point, Ore., detailed what he does specifically to address the issue of booties versus shoes; he carries with him at all times a pair of rubber-soled shoes solely for the purpose of installing window film. He doesn’t wear them any time other than when he’s inside a client’s house. Blades can also cause a hazard of which some installers are aware and others may not recognize. Stewart urged the audience not to just throw razor blades into their apron pockets, as he has also seen technicians reach into the same pocket for something else and cut themselves on the blade. “Track back your OLFAs, too, so you don’t cut yourself in the face,” Lawson added. Last but not least, Stewart also pointed out to know where you put your discarded liner and to use caution because, as he pointed out, it’s very slick and can cause the technician—or the car or homeowner—to slip and fall if he or she doesn’t see it. As the morning seminars had, the manufacturers recommended professionalism to the audience, too, because professionalism can be the make-or-break point of a shop’s success. Stewart said that organization is also a key factor for successful shops. “Organization and knowing what you can do for the customer. Curb appeal helps, too—taking care of warranty claims promptly,” he said. Closing out the afternoon was a presentation on what’s coming in glass. Window Film editor Brigid O’Leary gave a quick synopsis of some changes in the flat-glass industry that may affect the window film industry—some sooner rather than later—and Dale Malcom of Essex ARG brought slides of concept cars that have been shown at the Detroit Auto Show over the last few years, pointing out the changes in cars and glass use in cars. Of particular importance, Malcom explained that concept cars are more and more frequently having Lexan® and other plastics used in place of glass for windows and sunroofs, a fact that, should it make its way to production, could spell difficulties for both the window film and the auto glass industries. As if competing for the title of World’s Best Tinter isn’t stressful enough, imagine doing it under the scrutiny of the cameras belonging to a professional film crew. That’s what competitors in this year’s Architectural competition had to face. 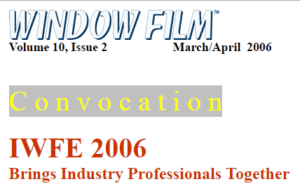 The 2006 International Window Film Conference and Tint-Off™ was filmed by award winning film-maker John Krokidas for a documentary on the industry that he plans to submit to the Sundance Film Festival. How’d the competition draw such high-caliber attention? Family connections. Krokidas learned of the competition through his cousin, Charlie Arakelian, who won second place at the inaugural Architectural Tint-Off competition in 2005. Adding to the pressure was the fact that he was the only previous Architectural Film Tint-Off competitor to return this year and the scrutiny of the camera may have just been too much; Arakelian just missed making the finals. After the preliminary rounds, Arakelian laid down on the floor for a few minutes, trying to shake off the stress of the competition. He was later overheard telling the documentary crew that he felt the pressure building and that it was “like being in a popcorn popper” while he was competing. Saturday, March 4, found most of the activity at the IWFE Tint-Off, but not everyone was there for the competition. Seminars led by Darrell Smith, executive director of the International Window Film Association, Scott Haddock, president of GlasLock, and Al Hardt of Alan and Associates all took place Saturday morning. Smith spoke about legislation within the industry and what it means for the industry, and returned later in the morning for a look at how shops can use legislation to their advantage. Haddock, who is also president of the Protective Glazing Council, took to the podium between Smith’s seminars, lecturing on security film and protective glazing since Hurricane Katrina and how providers of security window film can learn from it. Hardt wrapped up the morning with a presentation on decorative film and how to court clients along the full spectrum, from contract glaziers to interior designers. A successful turnout and enthusiastic audience base made the International Window Film Conference 2006 a success and the Tint-Off followed on its heels with some historic events (see Buggin’). Location, Depth of Field and World’s Hardest Car to Film Shape the International Window Film Tint-Off™ 2006. Seven Volkswagen Pasatts lined up in a row. That’s what the Auto Glass Tint-Off competitors saw when the curtain was pulled back. There were a record number of competitors for both the auto glass and architectural glass competitions this year. A grand total of 45 contestants signed up to tint competitively at the 2006 Tint-Off with eight people competing in the second Architectural Glass Tint-Off. And, following the trend set at last year’s competition, two of those competitors also competed in the Auto Glass Tint-Off, as well. One of the challenges for organizers of the event, and thus part of the goal with the Tint-Off 2006—both architectural and automotive—was to make the competition harder than it has been in years past. This year, competitors in the preliminary rounds of the Architectural Film competition were required to film a window with a center seam—the same requirement for last year’s finalists—and a double-hung window awaited the final four. Upping the difficulty quotient of the Architectural Film competition was the pre-competition decision that no straight edges were to be used, a factor that challenged more than one competitor. For the Auto Film Tint-Off, 39 contestants in the preliminary rounds were tinting the two sidelites (“roll up”) windows on the 2006 Passats and for a real challenge, the final four competed on a 2006 Volkswagen Beetle. Whitmer has been in the industry 29 years this year. “It’s where the money is,” he added, chuckling. On the automotive side, however, things took a lot longer to sort out. For the finals, competitors tinted the rear window of a 2006 VW Beetle and were given only 45 minutes. When all was said and done and the judging complete, Les Helton, owner of Performance Window Tinting Inc. in Carrollton, Ga., walked away the winner, edging out George Reyna with Tint Masters in Costa Mesa, Calif. and Andres De La Riva, who tied with Reyna for points but was slightly slower in completing his work. Crowd favorite Franz Hyland finished fourth. “I like seeing the camaraderie and seeing other people’s styles and what tools they use,” said Helton as he awaited the final scores. Naming the VW Beetle as the most difficult and his least favorite car to film, Helton added that working on a car that had been tinted previously was challenging, especially when it came to getting it clean. “I didn’t care that the doors were tinted … but it’s easier to get all the glue off when you do it yourself. You see things that other people miss and you can clean it to your liking,” he explained. A number of tinters said they’d be back next year, including Brian Felts with Computer Cut Tint & Graphix. A survey sampling the attendees to the 2006 event indicated that the majority of competitors will return next year, and those who wish to compete in the International Window Film Tint-Off™ 2007 will vie for the largest grand prize offered to date. The purse for first place will increase to $7,500 for automotive and $3,000 for architectural. The top three finishers will all receive a monetary prize. Competitive tinters will again be required to attend a mandatory meeting the day prior to the competition, where the rules relating to timing and scoring issues will be even more clearly defined than they have been in the past and all contestants will be asked to sign a copy of the rules before competing. An expanded score sheet will be available online in advance to review and at the end of the competition, judges will provide feedback on common problems. Contestants will be assigned a heat at a specific time. Scores will be posted in a timely manner and contestants will be able to leave and return to the competition area as their schedule allows. Contestant medals will be distributed at the end of each heat. Holly Biller has also returned to the position of Tint-Off coordinator. Brigid O’Leary is the editor of Window Film Magazine. We are Auto Tinting, Vehicle Wrap and Clear Bra Film Installation Service Professionals, and we are here for you and your vehicle. If you have any questions about our Products or Services, just call at (916) 358-3850 or send a message with our FREE Services Quote Today!